Note: Check with your doctor or your Wound, Ostomy, Continence (WOC) Nurse before you start or increase your exercise activities. What is good for one person may may be too much for someone else. Q: How do you keep the pouch securely attached even when you sweat a lot? How about when you swim? I always use an elastic mesh band to keep the bag tight to the body. I use this 24/7 and it comes in handy especially when I am running, as it keeps the bag in place. To manage the sweat, I make sure to change the ostomy barrier often. When training or racing in hot conditions, I always use Coloplast Brava® Elastic Barrier Strips for protection to give that extra layer of security and ensures my barrier stays put. When I swim in the pool, I use a pair of regular swimming trunks and a neoprene belt to keep the bag tight to my body and to avoid water pressure on the bag as well as to minimize the drag. Q: Do you carry any emergency ostomy supplies with you when you are exercising? If so, how do you manage to do so conveniently and discreetly? What do you take with you? How and where do you carry it? In daily training, no! I used to do so on bike rides in the first years after my surgery, but now I am so confident in SenSura® Mio and Brava Accessories, that I do not find it necessary. Back then, I carried an emergency kit in a small plastic bag with a spare barrier, bag, cleaning cloths etc. This would fit in the back pocket on my bike jersey. Today I usually just have a kit in my bag when going to the gym or swimming. The only place I now always keep backup kits is in triathlon races, where I have a spare kit in each transition zone, but I do not carry one with me on the course. Q: Are some sports and movements more difficult with an ostomy than others? Which ones are the hardest and which are the easiest and why? Q: Does the exercise affect your digestion rate? If so, how? Do you need to prepare or plan in any special way for that? Yes, definitely. Running can especially speed up my digestive system; but cycling does not affect it in the same way. When I swim, my digestion is affected if I swallow too much water that can cause gas. To help manage my digestion, I always pay attention to what and when I eat prior to a training session because I want to empty a full bag right before I start to avoid having to stop and empty a full bag during my training. Q: What’s your “#1” most motivational song to train/work out to? A: Absolutely simple answer: A remix of the classic millennium hit Toca’s Miracle called “Toca's Beautiful Strawberry Fields (Master Class Alliance)”. This tune is the sound of summer and has a nice steady rhythm useable for both spinning/trainer and running. Stephanie Hughes, author of the blog Stolen Colon, was diagnosed with Crohn's Disease when she was 13 years old. As a guest blogger for Coloplast, Stephanie gives her take on living life with an ostomy- everything from exercise, daily life, and even becoming a new mom. Click, flex, 1-piece or 2 piece? Ever wonder what the difference in between different ostomy bag options? Our blogger Stephanie from www.stolencolon.com shows the different 1-piece and 2-piece ostomy bag options. Stephanie shares the benefits of the SenSura Mio flex. 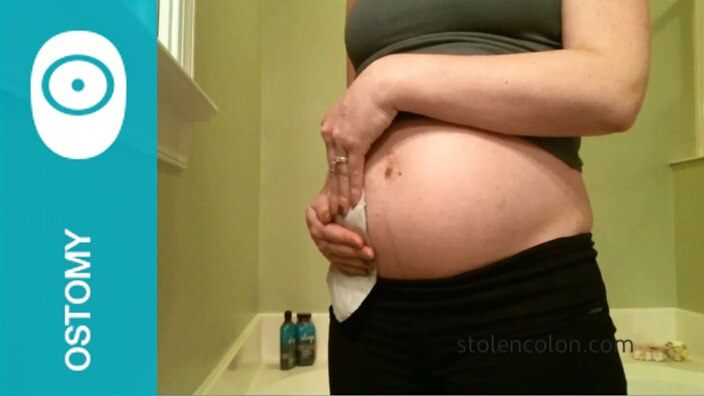 Watch her review of this flexible barrier option - flexible enough to fit her expanding pregnancy belly. Different ostomy bag options- what's the difference? So as you can see, there are a lot of great options. My best recommendation is to give all of them a try! You can get free samples of each and figure out what works best for you. (In fact, you can order some right here.) We all have different bodies, different ostomies and different things that we prefer, so know that what works for one person may not work the same for you. That’s why it’s great to be able to give all options a try. "My name is Stephanie Hughes and I was diagnosed with Crohn’s Disease in 1999, when I was 13 years old. After years of dealing with painful and embarrassing symptoms, on May 7, 2012, I had my colon removed and was given a permanent ostomy. The decision to go through with this surgery was a difficult one for me. For as long as I can remember, my mantra was “anything but surgery.” But after 5 hospitalizations between October 2011 and April 2012, I began to realize that while surgery was not something I WANTED to do, continuing on the path I was on was something I COULDN’T do..."